When buying a woodworker’s knife you should look for a thin, strong, flat blade. Don’t be put off by the disposable blade options as some of these can be sharpened and last up to 2 years. Paul recommends the Stanley Folding Pocket Knife model 0 10 598 and the Swann-Morton model SMO-R, which is available in the UK and the Stanley folding knife 10-049 which is available in the USA. These should be easily found if you search for these models, they should cost under £10 for a new one. Paul advises to stay away from the diamond-point knives as the meeting point of the two bevels wears away so you don’t get the type of tip that he suggests is ideal for woodworking. 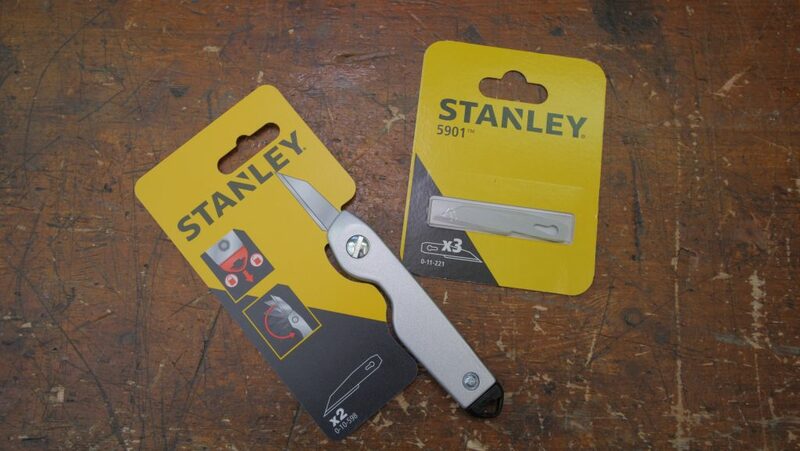 We purchased this Stanley knife for £7.39 and these spare blades for £1.97 from Amazon with free delivery. * We have found a different model of Stanley on Amazon.com which can be ordered from the US. Please note Paul has not purchased this, however it seems to fit his recommended criteria.